As you may have heard, a new $10 note will soon be making its way into your wallet. Its vertical orientation and portrait of social justice defender Viola Desmond likely caught your attention. Portrait subject Viola Desmond, a successful Black Nova Scotia businesswoman who fought against racial discrimination, is the first Canadian woman to appear on a regular bank note. She was chosen for her courageous stand for equality and social justice. In November 1946, she defiantly refused to leave a whites-only area of a movie theatre and was subsequently jailed, convicted, and fined. Her court case was one of the first known legal challenges against racial segregation brought forth by a Black woman in Canada. This is the first vertical note issued by the Bank of Canada. In keeping with the Bank’s innovative approach to design, this sets it apart from current polymer notes and allows for a more prominent image of the portrait subject. 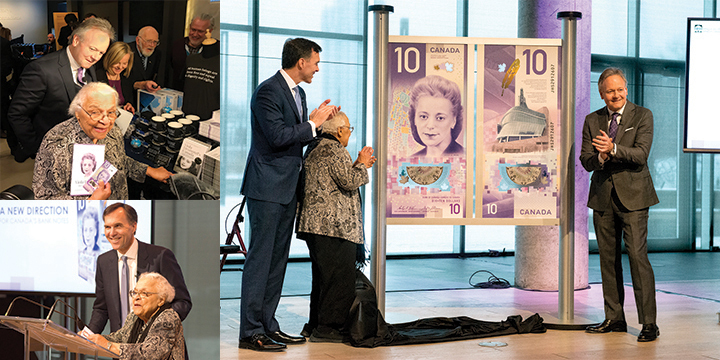 Viola Desmond was selected after the Bank launched an extensive public consultation to nominate an iconic woman for a new bank note. She is the first portrait subject nominated by Canadians. We received A LOT of nominations. Canadians definitely wanted to have their say on who should appear on the next bank note. The six-week consultation produced more than 26,000 nominations and 461 eligible nominees. These choices were then whittled down by an independent advisory council to a short list of five Canadian women. The Finance Minister ultimately made the final decision. The back of the new $10 note features the Canadian Museum for Human Rights in Winnipeg, Manitoba—the first museum in the world dedicated solely to human rights. The note also includes a depiction of an eagle feather, which is a symbol of truth, power, and freedom for many First Nations peoples in Canada. It’s intended to represent the ongoing journey toward recognizing rights and freedoms for Indigenous peoples in Canada. As with all Bank of Canada notes, security is paramount, and the vertical $10 includes several enhanced security features. These include transparent areas, raised ink on the front of the note, detailed metallic images and symbols, and the colour-shifting eagle feather. The bold features on this note are easy to check and difficult to counterfeit. The vertical $10 is printed on a polymer substrate, as all Canadian bank notes have been since 2011. Polymer notes are more secure, last longer (about 3.5 times) and they’re even recyclable! This may be the first vertical bank note in Canada, but you won’t have to handle it differently. It’s the same size as other bank notes and you can use it in the same way. This is the new regular $10 note you’ll see in circulation for years to come. The Bank issues new notes to stay ahead of counterfeiting threats and keep pace with advances in technology. Follow the Bank on Twitter (@bankofcanada) for the latest news about Canadian bank notes.